Online AP PGECET 2019 notification,schedule| Apply Online on www.sche.ap.gov.in: Online #AP #PGECET 2019 Notification: APSCHE, Andhra Pradesh will issue Post-graduate Engineering Common Entrance Test (AP #PGECET) 2019 in the month of February 2019. AP PGECET is a State level common entrance test. It will be conducted by the Andhra University on behalf of AP State council of higher education, a statutory body of Government of AP, Hyderabad. AP PGECET 2019 notification schedule, Online Application Form, Eligibility, Registration Fee, How to Apply, Instructions to Candidates, Last date, Hall Tickets, Entrance Exam Date, Key, Rank Cards, Results and Web Counseling Dates will be provided soon. 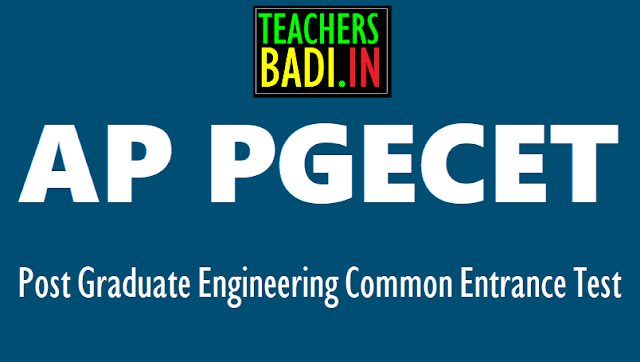 The Andhra University will invite the online application for appearing Post-graduate Engineering Common Entrance Test (PGECET) for admission into M.E / M.Tech. / M.Pharm. / M. Arch. / Graduate level Pharm. D (P.B.) (Full Time) in University and Affiliated Engineering / Pharmacy Colleges in A.P. for the academic year 2019-2020 as per G.O.Ms.No.54 HE Dept (EC-2) dated: 21-06-2007 and amendments. Eligible candidates who wish to apply for PGECET 2019 may submit their applications through online mode only including the payment of registration fee and generation of Hall Tickets. Candidates can visit the official website. for submission of online application. The related information regarding eligibility, syllabus, instructions and procedure for online application are available on the website: http://www.sche.ap.gov.in/APSCHEHome.aspx. Registration fee: Rs.1000/- ( Rs.500/- in case of SC / ST candidates). In case a student wants to appear for more than one test, separate registration fee has to be paid for each test. 2. commencement of online applications: 02-03-2019. Online #AP #PGECET 2019 notification schedule, Online Application Form, Eligibility, Registration Fee, How to Apply, Instructions to Candidates, applying Last date, Hall Tickets, Online Entrance Exam Date, Key, Rank Cards, Results and Web Counseling Dates will be provided soon.